Whenever Popeye gulps spinach, he looks amusing but that’s the power secret of this much loved cartoon character. Did you know that eating spinach can make you equally powerful? This leafy vegetable is a source of multitude of nutritional benefits. Here, BeautyGlimpse has tried to enlist a few. Super food Spinach – Enriched with nutritives such as carotenoids, vitamin K, polyphenols, minerals, spinach is the least advertised super food. It not only suffices your nutrition requirements but also makes you healthier. An anti-cancer and anti-inflammatory antioxidant– Spinach is enriched with more than a dozen of flavanoids. This compound is known for its ability to control free-radicals in the body. Spinach being a source of different flavanoids is considered as one of the most effective natural prevention against fatal Prostate cancer. These antioxidants are also helpful in flushing out metabolic waste in body tissues which relives one from joint pain. One of the healthiest vegetables to gorge on– 100 grams of spinach contains 2.3 grams of protein, 3 grams of iron, 3.2 grams of carbohydrate and around 81 grams of calcium. It is really hard to find another vegetable with such high nutrition content. Makes your bones stronger– The nutrient content of spinach shows that it contains 81% calcium. This amount of calcium is enough to make your bones stronger than ever, if you consume Spinach regularly. For Acne free face– Spinach is good for your health as well as for beauty. Its vitamins such as Vitamin A, Vitamin C, and Vitamin E make your skin better and its anti-oxidant keeps your face free from acnes and pimples. Makes your vision sharper– Abundance of vitamin A in spinach makes this leafy veggie a food for eye too. Vitamin A and carotenoids fight with probable eye disabilities such as cataract and macular dysfunction. Rich Source of Omega 3 Fatty Acid– Spinach is abundant with plant extracted omega 3 fatty acids. This supplement incorporates amazing ability to control bad cholesterol and increase good cholesterol. Thus, including spinach in your diet also keeps you prevented from cholesterol caused diseases. Betters Artery health – Spinach is supposed to have qualities which improve our artery health. It plays a crucial role in reducing dangerous plaque buildup and blood clots in arteries. These blood clots and plaques lead to brain which creates risk to your life. Keep eating spinach for a sound artery health and a sound life. Cuts down acid formation in the body– Obesity is mostly triggered by the consumption of diets which builds up acid in body. Such diets reduce our energy level and increase fat saturation in our body which makes us prone to fatness. Spinach reduces that acid build up by alkalizing our body and balancing its pH. 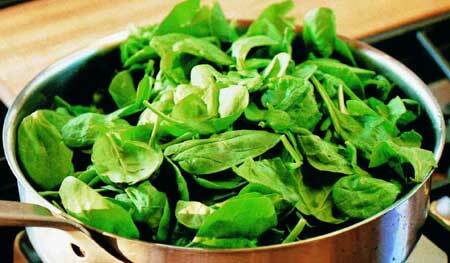 Prevents Heart Disease– Presence of Vitamin A and Vitamin C makes spinach a diet to prevent heart diseases. Vitamin A is essentially a concentrated form of Beta Carotene which is known as fat soluble antioxidant while Vitamin C is water soluble antioxidant. Both these elements mix together to stop cholesterol from being oxidized. Note – oxidized cholesterol sticks to walls of blood vessels which becomes alarming for health of your heart. Spinach is the easiest available source of vitamin K – one of the most important vitamins for our body. This form of vitamin not only allows an open wound’s blood to clot but also prevents calcification in the body. Note – calcification is buildup of calcium inside body tissues. This is an unfavorable body condition which could lead to cardiovascular diseases. A diet for pregnant women – Spinach has high contents of iron and folic acid which are essential supplements for pregnant women. Consuming this vegetable during pregnancy will endow you and your baby with a great health. High Nutritional value -100 grams of spinach contains around 2.3 grams of protein and several other nutrients. If you are planning to go for a diet which could suffice your nutrition need without letting you gain weight, spinach would be a great option. No Fat – Raw spinach contains 0% of saturated fat. This edible leaf gives you energy without paving way for fat. Energy Resources -Spinach resources energy in your body. And, if consumed every day, it’ll make your health, hair and skin wonderful.